I stumbled upon this item completely by accident when I was searching Walmart’s site to see if their exclusive Jabba the Hutt, Slave Leia & Salacious Crumb Funko POP! figure was available (answer: no). But this was a nice consolation prize! These kinds of decorations have been around for a while, but they always seem to focus on Vader, Yoda and R2-D2, and to a lesser extent some other characters. Rarely do they make anything for Jabba. But Gemmy has a fairly large line of these, including characters like C-3PO and Boba Fett, as well as the usual suspects. I’m not sure if they’re Walmart-exclusives, but I think they may be. 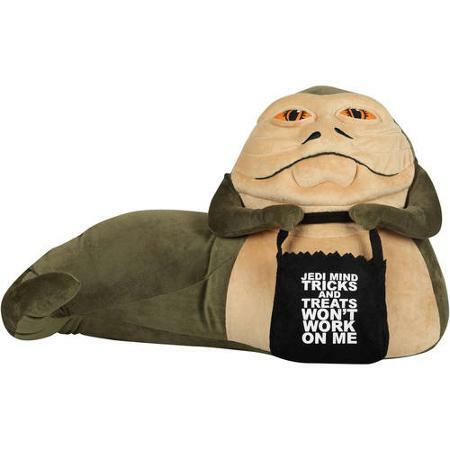 He’s got a treat bag that reads, “Jedi mind tricks and treats won’t work on me,” which is obviously a reference to Jabba’s line from Return of the Jedi about Luke’s Jedi powers not working on him. It’s cute, and a bit of an inside joke for Star Wars fans, rather than the usual easy jokes, so it gets full marks from me on that front. However, compare the photo from the Walmart website with what I got above and you’ll see that the actual item has way less stuffing in it and generally feels a bit deflated. 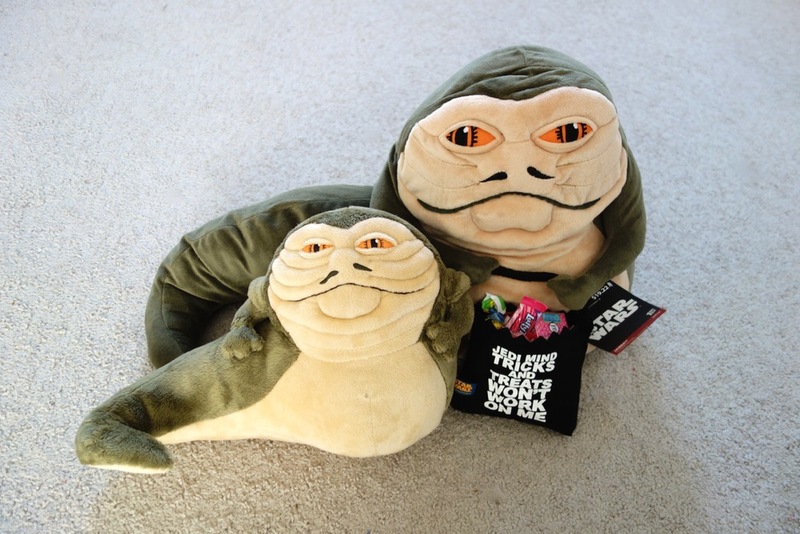 These things are basically plushes, but they have some plastic or cardboard sheets inserted in their bottoms to help them stand, and in Jabba’s case there’s also a plastic pole of some kind sticking up inside him to help him maintain his shape. The stitching and stuffing are not nearly as nice as a well-done plush, however, and I don’t think this would stand up to actual play very well. Admittedly, it’s marketed as a decoration and not a toy, but it’s worth noting. I should also mention that this is pretty huge! It’s called a “21-inch” figure on Walmart’s site, but the dimensions given are roughly 25″ wide by 14″ high, so I’m not sure where the “21” came from. 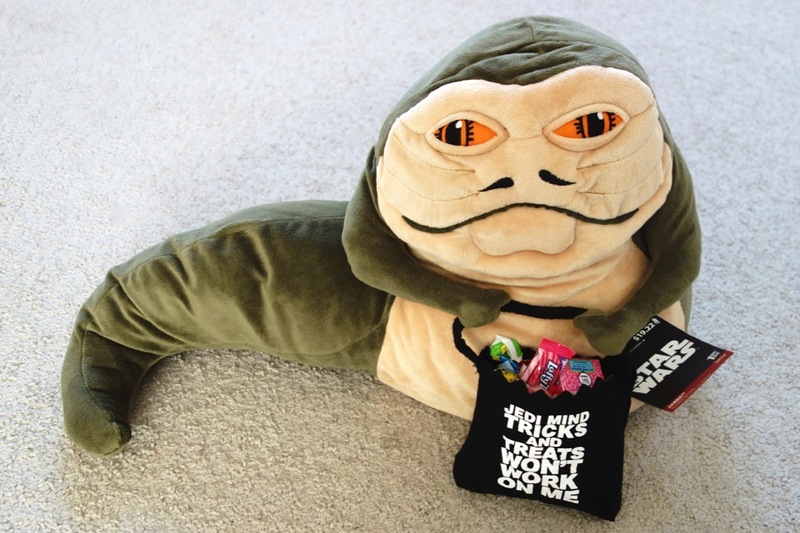 In any case, it’s easily the largest Jabba plush ever made. It’s also extremely similar to the talking Jabba plush made by Underground Toys, if a lot larger. The Underground Toys version is much better made, and the material is also a nicer fuzzy plush. I’d definitely choose it over the Gemmy version if I had to take just one. But the Gemmy one does have size going for it. For some reason these appear to be no longer available on Walmart’s site, but I’ve seen a couple of people on Twitter post pictures of them in stores, so they must be getting out there.